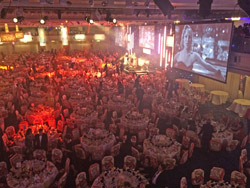 Held at the beautiful Grosvenor Hotel in London, the Danilo team were excited to attend the 2015 Licensing Awards last night. 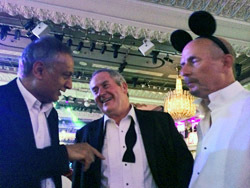 Designed to celebrate the achievements of all aspects of the licensing industry, a whopping 1,400 retailers, licensees, licensors and suppliers were present at this prestigious event. And what a great evening it was! Hosted by comedian Miles Jupp, we enjoyed a lovely champagne reception as well as a delicious 3 course meal and even tried our luck in the bespoke Casino area. We were delighted to be nominated for Best Licensed Paper Products or Stationery Range award for our Despicable Me Greeting Cards and Calendar Range but were even more pleased to see that our retailer friends ASDA won the Top Retailer Award. 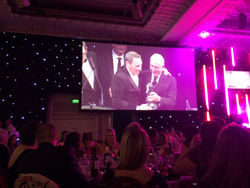 Also big congratulations to E1 Entertainment’s Peppa Pig, Disney’s Frozen, Liverpool FC and Thomas and Friends who all won Licensing Property awards but we especially want to applaud David Scott who won the Honorary Achievement Award – Congrats David!